Jesus calls the servants and tells them to fill the water-pots with water. IN CANA, Alittle town of Galilee, lived some friends of Jesus and his mother. One day these friends invited Jesus, his mother, and his followers to attend a wedding in their home. They invited many other people also, and prepared a feast for them. Perhaps these people were poor; for they had not prepared enough wine for all the people who came to the wedding. And before the close of the feast the wine was all gone. Mary, the mother of Jesus, saw that the wine had all been used, and she called Jesus aside to tell him about it. She knew of his wonderful power, and she believed he could surely help in a time like this. Then she told the servants who waited at the tables to do whatever Jesus might command them; for she expected him to supply the need in some wonderful manner. In every Jewish home there were large vessels, called water-pots, which the people kept filled with water to use in washing their hands and their feet. The Jews were very careful to keep themselves clean from dust and dirt, and because they walked about everywhere with only sandals on their feet they needed often to wash. In this home where the wedding-feast was being held, six large water-pots of stone were kept for this purpose. 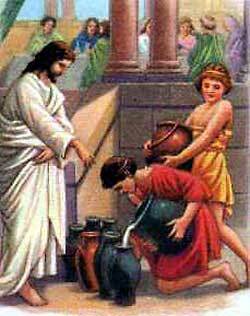 Jesus called the servants and told them to fill the water-pots with water. And remembering his mother’s instructions to them, the servants drew water and filled the vessels to the brim. Then Jesus told them to draw out from the vessels and fill their wine-pitchers again. When they obeyed they saw that wine flowed from the vessels they had just filled with water. At these Jewish feasts one man was chosen to be the governor, or ruler of the feast. He tasted the food and the wine before it was placed on the tables to serve the people. Jesus told the servants to take this wine to the governor and have him taste it, just as he had tasted the first wine that had been served to the guests. This was the first miracle Jesus performed, and it showed his willingness to help people who are in need. When the men who followed him saw what he had done they believed on him, for they knew that no man could change water into wine as he did.